Hello world! I suppose after 2 months it's time to take the blog off of auto pilot and start posting again! Thank you all so much for bearing with me as I took a maternity leave just letting the scheduled posts take over. I can't promise how much I'll be around in the coming months, we have a lot of commitments that I wasn't quite expecting for the months following our daughter's birth. But it's been an adventure and we've been able to spend time with some family and friends we haven't seen in a very long time!! Ok, back to the recipes. I have still been cooking during my blogging hiatus but admittedly not a whole lot of new recipes, I've basically been on auto pilot. But this is one I made recently to try to mix things up and we really enjoyed. It was one of those last minute, throw a bunch of stuff together and pray for the best. And it was a pretty big hit! My little Sous Chef ate like 3 of these in one sitting which is very unusual for him. I used leftover of the Shredded BBQ Chicken I made, and some yummy biscuits and turned one of our favorites into something entirely different. I hope y'all will enjoy! Preheat oven according to biscuit package (typically 350F degrees). Spray a muffin pan with non stick cooking spray. Cut the biscuits in half and in your hand form each half into circles. Place the circles in the muffin wells and spread out so that there is a little well in the middle of each piece of dough. Place about 1 tablespoon of bbq mixture in the middle and top with cheese. Bake for about 15 minutes or until the cheese is melted and the biscuits are golden. Serve warm. This was a very simple recipe that didn't require much if really any prep work. Great for a last minute week night dinner, or even a simple party food. 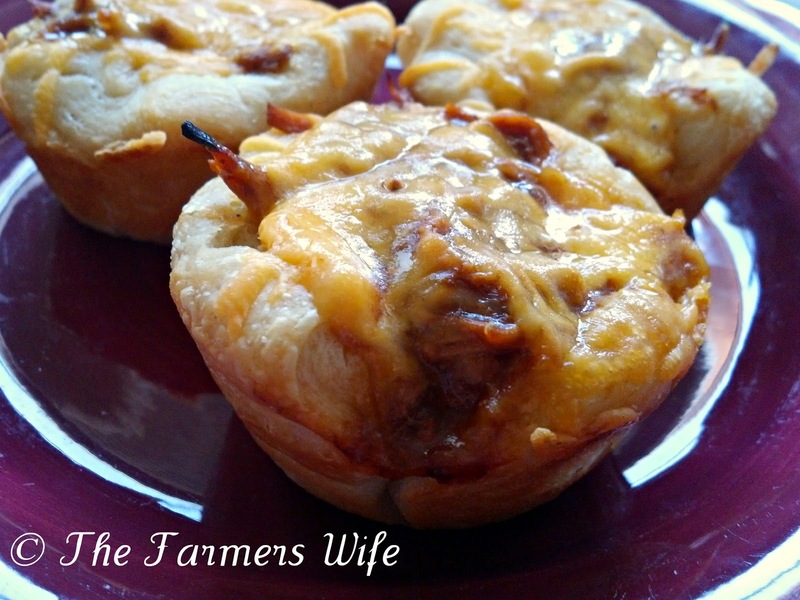 You could easily make this an appetizer by cutting the dough into quarters and using a mini muffin pan! 4 stars. Welcome back! I like this easy recipe! These chicken cups look lipsmacking!